New front windscreen for mot. Owned for 2 years lots of old paperwork, receipts and mot papers. I've never towed. Window spats. Eyebrows on headlights. New alternator. New shocks on front. only been to mot and back. 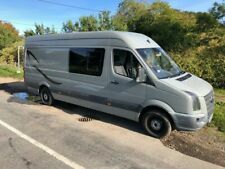 There's also a turbo fan fitted in the roof it has a leisuredrive rock and roll bed and full matching upholstery from cab to rear,in the hit op is a pull out bed with mattress and can sleep 1 or 2 small children.the van is compact and has everything you need. Here i have for sale a 2016 Renault Trafic camper 120 bhp with 25,500 miles complete with toilet and shower. privacy glass windows with curtains cad curtains. alloy wheels and gloss black side bars. double passenger swivel seat. LDV convoy 400 LWB 2.5 diesel high top. this is a ldv camper, it has been converted from a convoy 400 lwb mini bus. as you can see in the photos it has a 4 burner gas hob with oven, a fridge which is a 3 way. Here is my Citroen relay camper. But I won’t give it away it’s a very good camper and I’ve spent a lot building it. I’ve built this so you do not need 240 hook up everything is useable off battery and gas and with the oversized solar panel I’ve never had a flat battery. New listingVW Volkswagen T5 Transporter Camper Van. Look!!!!! Volkswagen 'Jurgens Autovilla'South African VW conversion, coachbuilt 'Jurgens' caravan professionally mounted on a VW bay window chassis. Arguably the best VW camper conversion available, the origional design basis was copied for the later German Karmann kombi. Large pull down bed (very comfortable). New habitation test just carried out all very good. New battery and new tyres. Top storage cupboards with LED lights under. IN VERY GOOD CLEAN CONDITION ( A few age related marks). For sale is this freshly converted Renault master camper van, which has been professionally completed, by myself,a carpenter by trade, with lots of van conversion experience. -Renault master with a manual 6 speed gear box. Spec as follows. The van had a new engine fitted due to the cambelt snapping on the original engine. Will be gutted to see it go as it’s my pride and joy but I’m looking to upgrade to a 7.5 ton truck.